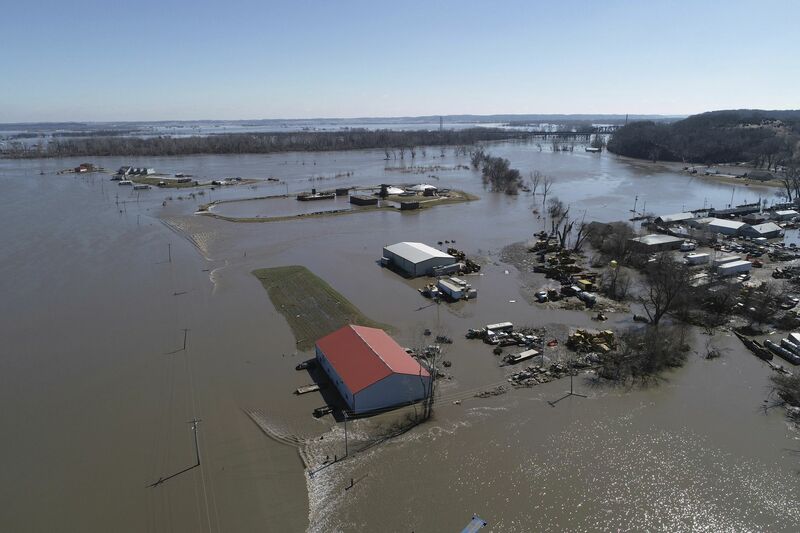 For areas of the Midwest hit by this year’s deluge of rain and melting snow, extreme weather has caused some of the worst flooding in living memory. Governors declared states of emergency in Nebraska, Iowa, Wisconsin, Missouri, and North Dakota. Thousands of homes and farms are facing water damage and the problem will get worse before it gets better. As the record snowpack from the wettest winter on record melts over the next few weeks, it’ll add to already overflowing waterways. The National Oceanic and Atmospheric Administration (NOAA) predicts major flood risk along the Missouri, Mississippi, and Red River of the North, defined as “extensive inundation of structures and roads, significant evacuations of people and/or transfer of property to higher elevations.” Federal officials warn that 200 million people in 25 states face a flood risk through May. “This is shaping up to be a potentially unprecedented flood season,” Ed Clark, director of NOAA’s National Water Center in Tuscaloosa, Alabama, told Wired. The midwestern floods join the lengthening list of unprecedented and unexpected natural disasters accelerated and made worse by climate change. And, just like other climate events that have caused widespread damage, our planning, resiliency, and flood insurance programs are ill-equipped to cope. When flood risk in the country is discussed, it’s often in the context of coastal communities and rising sea levels brought on by climate change. “Underwater: Rising Seas, Chronic Floods, and the Implications for US Coastal Real Estate,” a detailed analysis of future flood risks and property damage by the Union of Concerned Scientists, predicted that by 2045, roughly 300,000 homes and commercial properties on the country’s coastline may face chronic, disruptive flooding, threatening $135 billion in property. But overflowing rivers and inland flooding present similar threats. Scientists are still determining the degree to which climate change impacted this spring’s flood cycle, but they do know that warmer temperatures, which lead to more moisture in the air, can potentially turn a minor flood into a full-blown disaster. This winter and early spring, the Mississippi River basin received three times as much rainfall as normal. The last few decades have witnessed an unmistakable trend towards more extreme weather in the Midwest. Heavy-rain events have risen 37 percent since the 1950s, per the National Climate Assessment, which says climate change will bring extreme heat, drought, and heavy downpours to bear on America’s farms and eventually decrease productivity. Going forward, the Midwest is expected to receive some of the greatest increases in yearly precipitation.